Hand Readings of famous people: Who is Malala Yousafzai? Much has been written about Malala Yousafzai; glowing tributes in the west and some criticism from her countrymen, even after winning this year's coveted Nobel Peace prize. So, who is she really? A courageous girl who stood up against the Taliban to fight for education, or a puppet of the west? Or is she simply an ordinary girl who has been thrust into the limelight, someone who does not deserve her fame? 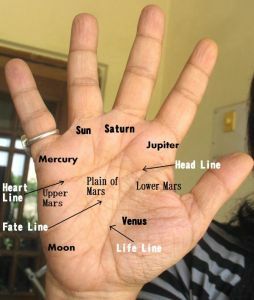 her strong mounts of Jupiter, Mercury and Uppers Mars and strong lines, straight fingers, and a good thumb. Together they show that she is possibly as brave as she is reputed to be. A person who can be calm and think objectively in a crises, can stand up to people and is not easily discouraged. You can check out a photo of her hand here. Malala Yousafzai's hands show that she is a person with sufficient will power and good character. There is ambition shown, more so because of her prominent Jupiter finger. The well-developed sense of self and heightened self-awareness is another reason why she was able to stand up to her enemies and fight back. High self-esteem, and a strong sense of self give fuel to courage. Plus, there is some idealism in her personality too. She is also straightforward. With all these personality characteristics it is not surprising that she has political ambitions. This does not automatically mean that she will become a successful politician. She has the right motives, but without the right opportunities it cannot happen. Also, her hand does not show great determination. Instead it shows flexibility, enjoyment of comforts and a soft inner nature plus a certain gullibility. It leaves her open to influence and manipulation. These are deterrents to becoming a successful politician. If anything, a successful and powerful politician has to be a little wily, and she is not. However, she is still very young and as her circumstances have changed rather suddenly and it is more than likely that her personality could change further, and with it her future. You might also like Yousaf Raza Gillani hand reading or Hand analysis of Ayatollah Khomeini or Pakistan's Imran Khan or try any of the labels below this post. As she is young, I think, her personality might change in the coming years. Can palmistry predict how personality might change after a few years, for young people? If the seed is sown, then the changes are already manifest on the active hand. That is why there is the difference between the two hands even in very young people. The subconscious knows it because the idea has been planted. My travel line curves down and touches the outside life line? does this mean fatality? Our future is not a fixed one so there is no point trying to predict fatalities.